The 4304A Wattmeter uses the basic construction of the Model 43 and modifies it with a special broadband element and range switch for general purpose RF power measurement without the hassle of carrying a set of individual elements. 25-100 MHz, +/- 7% of full scale, using correction charts. 100-512 MHz, +/- 6 of full scale, no correction needed. 512-1000 MHz, +/- 7% of full scale, no correction needed. 25-1000 MHz, 5-500W, Portable Wattmeter, no elements to purchase as this meter comes with the only element that is needed. 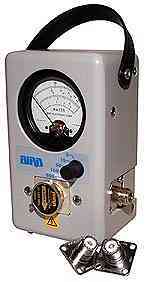 General purpose field power measurement from 25 MHz to 1 GHz and up to 500 watts.